Suspect wanted for using bat to beat bicyclist in downtown | Crime Stoppers of the Lowcountry: 554-1111 | 1-888-CRIME-SC | Anonymous tips earn cash rewards with Crime Stoppers of the Lowcountry. CHARLESTON, SC (WCSC) - Police are on the lookout for a man who used a bat to beat a bicyclist in downtown. The Charleston Police Department is looking for the driver of a Jeep Grand Cherokee who was involved in an aggravated assault early Sunday morning. Around 2 a.m. on Sunday, three people were walking on George Street when the suspect drove up to the three and exchanged words. Police say the incident was over one of the three walking on the roadway and not on the sidewalk. According to investigators, the suspect left his vehicle and approached the 23-year-old victim and began to strike him with a baseball hat. The victim said that he was struck on his back and on the back of his head. Police say the victim attempted to use his bicycle to block the swings. One of the witnesses said the suspect then tried to attack him, but he was able to take the suspect's bat from him. The suspect then ran behind his vehicle. Before the suspect left the area, the witness said he damaged the suspect's front driver side light and smashed the front driver's side window. The driver is described as a white male with olive complexion, between 5'7 and 5'9, muscular build, 210 lbs, short cropped dark hair and wearing khaki shorts with a white or grey t-shirt. 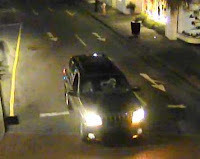 The vehicle is described as a newer dark gray Jeep Grand Cherokee. The vehicle was last seen heading north on Meeting Street from George Street with a broken front driver's side window and a broken driver's side headlight. Anyone with information about this incident can call Charleston Police at 577-7434 or Crime Stoppers at 554-1111.